PASCAGOULA, Miss., June 2, 2007 (PRIME NEWSWIRE) -- In a traditional ceremony here Saturday, the U.S. Navy's 53rd Aegis guided missile destroyer, Truxtun (DDG 103), built by Northrop Grumman Corporation (NYSE:NOC), was christened before more than 1,000 guests. The ship's namesake, Thomas Truxtun (1755-1822), was appointed one of the first captains in the U.S. Navy and then selected by President George Washington to command the nation's first naval ship, USS Constellation. "Half of all U.S. Navy surface ships are built in this Gulf Coast yard," said U.S. Representative Gene Taylor of Mississippi's fourth district, as he delivered the keynote address. He later avowed to the perspective crew, "I am totally confident you'll be sailing on the best destroyer in the world." 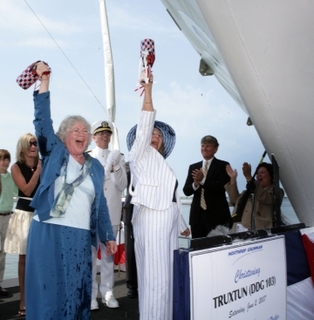 Truxtun's fourth generation great-granddaughters, Susan Scott Martin from Woodbury, Vt., and Carol Leigh Roelker from Cincinnati served as the ship's co-sponsors and simultaneously broke champagne bottles across the bow, formally naming DDG 103 Truxtun. Truxtun (DDG 103) is the sixth ship to bear Commodore Truxtun's name. The third Truxtun, DD 229, was destroyer during a storm off the coast of St. Lawrence, Newfoundland, Canada along with the supply ship Pollux in 1942. The icy waters claimed the lives of 110 crewmembers but dozens survived thanks to the small mining town of St. Lawrence, Newfoundland, Canada. The entire town helped to rescue the sailors. The current mayor of St. Lawrence, Wayde Rowsell, spoke on the history of the incident and recognized two survivors in the audience, Ed Lewis and Lanier Phillips. "These sailors will never be forgotten," said Mayor Rowsell. "I believe that the experiences that all of us have endured have shown us that hope never dies, compassion never sleeps and love is indeed eternal. I thank the U. S. Navy for keeping the memory of Commodore Truxtun and the ship's crew alive, and I thank the shipbuilders of Northrop Grumman who surpassed great odds and have shown true leadership, grit and stalwart determination." "I want to thank a very important group who is here today -- the shipbuilders who have been fitting and welding steel, installing machinery, pulling cable and hanging ductwork to create this powerful ship soon to christened. I think I speak for all of our employees when I say that this ship is truly special to us. We have been through a lot together. The Truxtun has already inherited the resilience and toughness of our shipbuilders, but it holds our affection as well," said Kevin Jarvis, vice president of ship construction for Northrop Grumman's Ship Systems sector. "It is both my privilege and honor to orchestrate the efforts of a truly phenomenal shipbuilding team. Through their collective efforts, this team has worked tirelessly to bring this magnificent ship to life," said U.S. Navy Rear Adm. Charles H. Goddard, Program Executive Officer for Ships. Truxtun is a highly capable, multi-mission ship that can conduct a variety of operations, from peacetime presence and crisis management to sea control and power projection, in support of the national military strategy. Truxtun will be capable of fighting air, surface and subsurface battles simultaneously. The ship features offensive and defensive weapons designed to support maritime defense needs well into the 21st century. Cdr. Timothy R. Weber is the ship's first commanding officer and will lead a crew of 276 officers and sailors. The 9,200-ton Truxtun is the 25th Arleigh Burke-class destroyer built by Northrop Grumman. The ship is 510 feet long, has a waterline beam of 59 feet and a navigational draft of 33 feet. Four gas turbine engines will power the ship to speeds in excess of 30 knots.